As trends and technology changes, we can’t deny that it gave differences to culinary worlds. It affects food in a way that might not be that direct, but real. We might can rarely found the candies or sweets that used to accompany us along our childhood. Candies that you usually eat on your elementary school with your friends, or perhaps when you’re still in kindergarten. People with changed and improved mindset have developed new kinds of candies that the elders might never think of. All of these changes and improvement aren’t bad, though. They are great, of course. We get to taste all of those delicious foods, snacks, and candies. But, somehow that make us miss the old days, right? Perhaps simply missing the legendary Uni Soviet candies and sweets. All of those yummy candies wrapped in fancy wrappings that remind us of old times. Well, for youths, these are candies that you might never even know. However, such taste never fails to make us smile, taking us back. 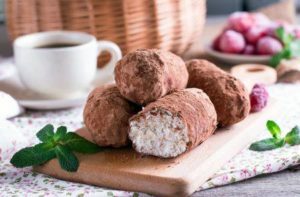 Those taste might even be as good as or even beat the delicacy of the most favorite dessert in Russian cuisine somehow. A long time ago, this cake was made in people’s kitchen and enjoyed by children or perhaps by teenagers in best cafes in Russia for youngsters. It’s so popular among sweet lovers for its goodness. It’s also very simple and easy to make if you ever feel like want to take a bite of this. The ingredients you’ll need are leftovers sponge cakes, cookies, ginger bread, any bread leftovers you can find. The ingredients that you choose then will be crunched onto pieces then mixed thoroughly with butter, condensed milk, and cognac if you want. After those yummy ingredients are well-mixed, it’s time to shape it. Usually, it is shaped in a small potato- like shape before then covered in generous amount of cocoa powder evenly. What a yummy treat from simple ingredients that you can make wherever you are. Well, even though it’s simple, it has been children’s friend in the past and maybe even now. Candy lovers you may cheer happily. This popular soya bars have never failed to lure people from Soviet era until now, from kids to adults, from local to tourist. As these soya bars are made in tiny size and wrapped in fancy wrappings, people always love to take a bite. Since it’s made from the mix of wafer and grated peanuts, it’s specially crunchy yet soft in the same time. People usually enjoy this candy for holiday season, due to its price that considered as expensive that time. However, children love this candy so much that they can always find them where their parents hide that even on usual day. Wafers, almond praline, and dark chocolate. Did you just gulp and lick your tongue, imagining those goodness taste in your mouth? Well, it’s no wonder that this candy manage to amuse many people. All of those three ingredients can be found in a blue wrapper of Mishka Kosolapy. With the beautiful painting of Ivan Shishkin and Konstantin Savitsky titled Morning in a Pine Forest, it’s so memorable to some people. If you’re so fond of this and want to bring it for someone you visit, then it’s good since you know the most important things to know when visiting a Russian house is to bring something along with you. Since it’s just so beautifully made both the wrappings and the chocolate itself, people would hang this on the tree during new year season beside symbols and tradition of new year in Russia. Soviet children who love sweets surely know how to make simple, cheap, yet yummy sweets from scratch. Even though this sweets can also be found in many other places than Russia, especially nowadays, it’s still something that Soviet would remember in their childhood. Children usually take a can of store-buy condensed milk and just simply boil it in the water. Although it might be dangerous, they somehow learn and know how to make this legendary Uni Soviet candies and sweets in a safe way. In the warmer region of South Russia, sunflowers grow quite well. This is one of the practical reasons why there are a lot of sunflower seeds in Russian cuisine. Back in the Soviet era, they usually enjoy eating this candy made with sunflower seed’s butter. This legendary candy is still enjoyed until now, but with a twist. Since people nowadays love chocolate a lot and like to put it in every possible food they can find, so they dip halva into chocolate. And, you can guess the taste. It’s just amazingly delicious and worth to try. Although it might not be something that consist of chocolate or any fancy ingredients, it’s humbly delicious. You won’t regret having a bite of this Soviet bars. Everyone loves toffee. Whether it’s the store buy one or the homemade one will always be Soviet children’s favorite. As for the store buy one, there are few variations such as the hard one or softer one. These candies were their friends of childhood, along with all of the stickiness that stick onto their memories. It’s that sticky that it often sticks to the wrappers and make you enjoy candy with paper so delicately. However, although toffee were not that expensive that day, not everyone can buy it so easily. So, this is what initiate the homemade toffee. Both are great, both are able to take people back to their old times when they love candy so much and perhaps even visit dentist a lot. Kids love sugar a lot, no matter in what form is that. Be it in candies, drinks, cakes, or even without being processed further. They usually eat white bread along with butter and sugar. Such a simple combination for a magnificent taste that they can get. Sweet, a bit of saltiness from the butter, and the soft bread. This kind of combination is also quite popular in some other country. It’s perfect for breakfast, or maybe even just as snack along with a cup of tea or coffee. As we keep going forward, moving faster along the technology improvement we will experience a lot of changes. Not just in the technology itself, but also in many other sections. Such changes shouldn’t make us forget what’s in the past. We still need to try reminisce the old days, or even remake what we can to take a bite of the past. The past when the resources and technology were still limited, yet people invent delicious sweets in a creative way. Those simply made foods might also beat the best Russian food for party or celebration. Well, who knows that the legendary Uni Soviet candies and sweets will make you fall in love right at your first bite? It might be as great as candies nowadays or maybe even a lot better.